I can barely contain myself. I am going to see Sir Elton John in Las Vegas! For those that do not know, I am a huge Elton fan. 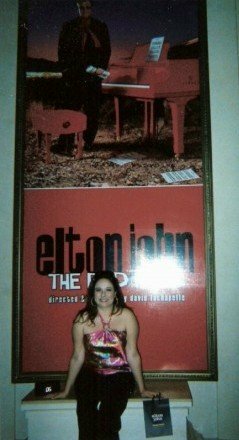 I am such a big fan this might be my 14th Elton concert. No judgment. Growing up, my parents enrolled me in piano lessons. While Chopin, Mozart or Schubert were fine for other young piano students, I was most interested in making the piano rock. More specifically, rocking while wearing feathers, rhinestones and platform shoes. His music speaks to me and was the genesis of me being really interested in music, eventually developing into my love of copyright law with music. 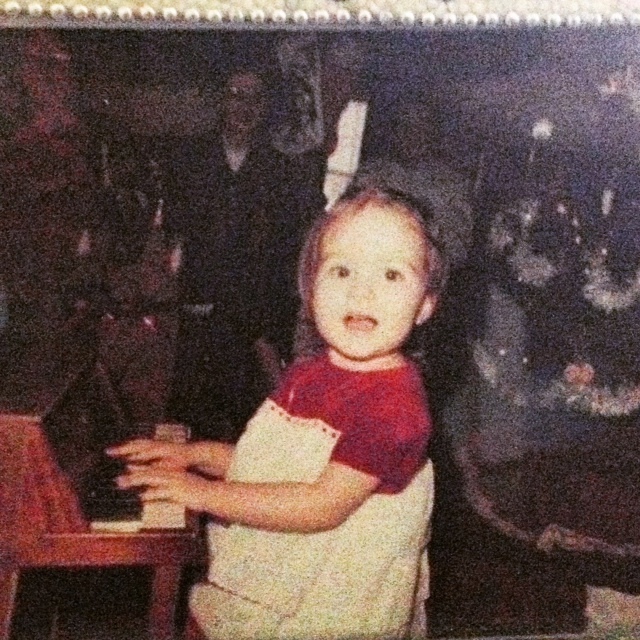 That is two year old me “performing” for my sweet grandmother on my very first tiny piano. That crushed red velvet is definitely Elton style. In addition to all of the number one hits on radio, Sir Elton has also had quite a career in film by way of scoring and composing original songs. One of my favorite films he wrote music for is Disney’s The Lion King. I remember attending one of my first Elton concerts and questioning why I did not hear Hakuna Matata or Circle of Life or really any of the songs from one of the top selling animated soundtracks of all time. Unbeknownst to 14 year old Ryanne, I was already starting to ask questions related to copyright law and music. I have a sneaking suspicion the reason you will not hear any of the Disney tunes from The Lion King during an Elton John concert lies in who owns the compositions. I am not privy to the terms of Disney’s contracts, but it seems like my theory could be a logical explanation. The copyright owner owns the exclusive rights to perform, display, distribute, make copies and the right to prepare derivative works. See my earlier posts for more on the exclusive rights – The Magic Wands of Copyright. In the case of The Lion King, the question becomes who is the author? Is it Elton John or is it Disney? A copyright in a musical composition or a sound recording belongs to the author. If the author is an individual person, then the copyright rests with the individual. Meaning, if I were to write a book, until I give the rights away, I own the copyright in the book. However, in the case of another entity (such as a company) hiring someone to complete a task, then the hiring party would more than likely own the copyright in the completed project. This is more widely known as “work made for hire.” If the deliverable/completed project is a work made for hire, then the employer (a company) is considered the author and owns the copyright. I need all my favorite things on my desk at work. Elton bobblehead, Kermit and a photo of Belle. In order for a work to be considered a work made for hire, three conditions must be met under 17 U.S.C. §101. the parties sign an agreement (a contract) designating the deliverables under the contract will be considered a work made for hire. In the example of Elton John with The Lion King, I think it is easy to assume that Elton John performed the tasks as a work made for hire, thus Disney is the owner of the copyright in the songs created. The three conditions must all be met, as designated by the use of “and,” in order to have a work made for hire. There is no doubt the songs were specially commissioned. The songs were part of a larger motion picture, which falls within one of the nine designated categories. Finally, why I cannot be certain, I would have a hard time believing Disney did not have a contract in place with Sir Elton that outlines ownership rights in the completed songs. Drawing the conclusion of this being a work made for hire seems logical. Disney was the employer and Elton John was a work made for hire. Thus, Elton has no ownership rights in the music from The Lion King. The author and owner of the songs is Disney. So, why doesn’t Elton perform the songs during his concerts? There could be a variety of reasons. Maybe the contract terms, with Disney as the owner of the final songs, did not give Elton the public performance permission necessary in order to play the songs during concerts. Maybe the licensing fees Elton would need to pay back to Disney for the right to perform the songs would have been too much. Or, maybe Sir Elton is making a wise business decision. If Elton only performs songs he completely owns, then that is more money in Elton’s pocket. Regardless of the answer, I feel confident the reasoning lies in copyright law and work made for hire. Yours truly in front of the concert poster in Vegas in 2006. It was a trip with my Mom and Dad, and one of the best days of my life. Have you ever wondered why some songs make “the cut” on show night and not on others? Who is your all-time favorite performer? Take part in the comments section below and Stay Tuned In! « Should I Register My Trademark Without an Attorney?